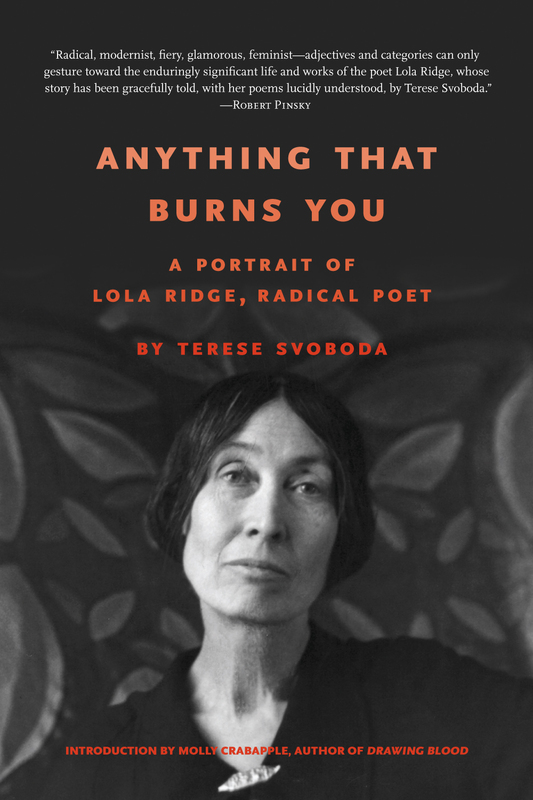 Anything That Burns You is the first full-length biography of Lola Ridge, a trailblazer for women, poetry, and human rights. Terese Svoboda takes the reader on a fascinating journey that follows Ridge's life from her childhood as an Irish immigrant in the mining towns of New Zealand to her years as a budding poet and artist in Australia, and then to San Francisco, Chicago, and New York, where she flourished as a poet and editor of the avant-garde journals Others and Broom. By the 1920s, Ridge was at the center of modernism: good friends with William Carlos Williams and Marianne Moore, while promoting the careers of Hart Crane and Jean Toomer, in addition to writing brilliant socially critical poems. At one time considered one of the most popular poets of her day, Ridge later fell out of critical favor due to her impassioned verse that looked head-on at the major social woes of society, infused with a radical belief in freedom that she gleaned from her mentors Emma Goldman and Margaret Sanger. Certain to revive the legacy of this unique artistic figure-as unforgettable as Virginia Woolf or Frida Kahlo-this lively portrait gives a veritable who's who of all the key players in the arts, literature, and radical politics of her time, in which Lola Ridge stood front and center. "Svoboda resurrects the fascinating life and work of Lola Ridge. A lively, complex portrait emerges ... of a talented, driven woman for whom 'art and activism were one' and who deserves remembrance not just as 'a fulcrum of modernism' but a premier poet in"
"Radical, modernist, fiery, glamorous, feminist- adjectives and categories can only gesture toward the enduringly significant life and works of the poet Lola Ridge, whose story has been gracefully told, with her poems lucidly understood, by Terese Svoboda." "Anything That Burns You tells the riveting story of Lola Ridge, a revolutionary and influential poet of her time, now (like so many female artists) lost to history. Terese Svoboda has written a brilliant biography, as original as it is compelling"
"In Anything That Burns You Terese Svoboda entertainingly parses the enigmatic life and powerful writing of Lola Ridge, an immigrant who burned for many years as a vital force among American artists challenging the 'socially acceptable' limits of "
"This is the biography of Lola Ridge many of us have been waiting for. Elegantly and accessibly written, thoroughly researched, it gives us everything we need to recover this extraordinarily versatile writer. Ridge was at the center of American modernism f"
"If any subject was going to entice poet, novelist and memoirist Terese Svoboda to bring her formidable narrative mastery to bear on the form of the literary biography, it had to be Lola Ridge. Bringing her own lyric eye to Ridge's poetry, Svoboda reveals "